Last week the History Center dedicated the Old City Hall Building’s former City Council Chambers and Courtroom as the newly restored Shields Room. The celebration marks the culmination of eight years, over $250,000, and the efforts of hundreds of individuals to return the room to its turn of the last century Victorian grandeur. James and Margaret Shields, the Journal Gazette Foundation, the Edwin M. and Mary McCrea Wilson Foundation, the John S. and James L. Knight Foundation, and many individual donors provided support for the restoration. The Shields Room, so named after the title supporters of the project, is now one of the finest galleries and banquet rooms to be found anywhere in Fort Wayne, or northeast Indiana for that matter. Although the Old City Hall Building, one of the state’s finest examples of Richardsonian Romanesque architecture, was built in 1893 for a then whopping $63,000, historians do not believe that the room was lavishly decorated at that time. Rather, it is believed that the magnificent decoration that the room now bears was done around 1900. 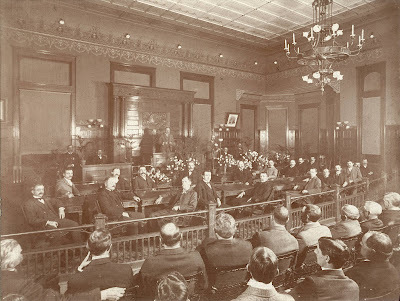 The earliest photograph of the room, taken in May 1901 to commemorate the installation of a new City Council, shows the room’s walls and ceiling splendidly decorated with the design it has today. The complex geometrical and swooping floral patterns bristling with gold leaf are clearly visible in that image. Oddly enough, it is believed that the room and these designs were entirely painted over shortly before World War I. In its place, an extremely modest border design was painted right above the wainscoting, demonstrating an odd hybrid design of Colonial Revival and Arts and Crafts elements. This began a sad progression of painting the room several times, as it morphed over the decades from white to pale green, light yellow, off white, black, and white. The restoration started in 2003 when the Journal Gazette Foundation provided the initial seed monies for the project. This allowed restorationists to travel back in time as they methodically stripped layer after layer of over painting, which had been applied over the past nearly 100 years, until they reached their target layer from the year 1900. After finding the original designs and patterns, restorationists conducted microscopic analysis on paint fragments to determine the original coloration. The original gold leaf was also found aplenty during the investigation. After uncovering nearly two dozen patterns in their entireties, multipart stencils were made for each and the actual renovation began. Approximately one eighth of the room was restored in 2004, a reveal slice allowing the public to see what was possible if funding became available to restore the remaining seven eighths of the room. 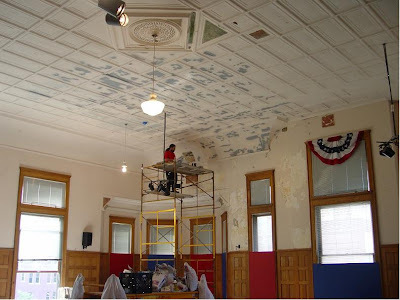 After taking a brief hiatus from the project to allow a new $1 million energy efficient heating and air conditioning system to be installed, the restoration recommenced in summer 2009. All of the restoration above the woodwork was completed by fall 2009. The golden oak wainscoting and trim, found throughout the room and in the main entryway, posed another set of challenges. Nearly 100 individual panels were split, broken, or otherwise unsalvageable for the restoration and had to be replaced. Tall and wide, one quarter inch, “quartersawn” oak boards, were costly around the turn of the last century, and are very rare and expensive today. Fortunately, similar boards were located in Michigan at a company specializing in exotic lumber. Craftsmen replaced all the necessary boards and even rebuilt a large section of walling, which had been unceremoniously covered with foam board several decades ago. The entire woodwork was stripped, stained, and fabulously refinished. The result truly makes the room glow, aided by the installation of 48 period lighting fixtures including seven dual gas and electrically lit “quad-globes.” Although the room does not utilize actual gaslights, the replica gaslights shimmer and dance with a striking low wattage flicker wire, mimicking the bygone ambience of yesteryear. 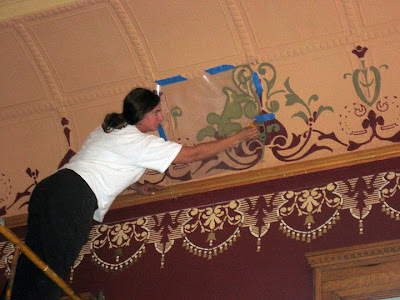 Finally, in late 2010, the second floor entryway to the room was restored and the original stenciling, “City Council [Room] 200,” was applied. The project finished when 24 period canvas roller shades were installed just in time for the 2010 Festival of Gingerbread. 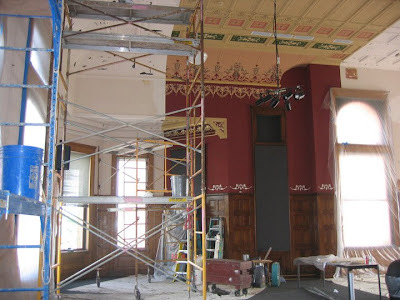 The restoration of the Shields Room is a signature component of nearly $2.5 million in capital improvements the History Center has recently made to its facilities. I encourage you to visit the museum to experience the restored room and step into the past, back to a time when the opulence and resplendence of public buildings were visible manifestations of our community’s sense of pride and promise for the future.